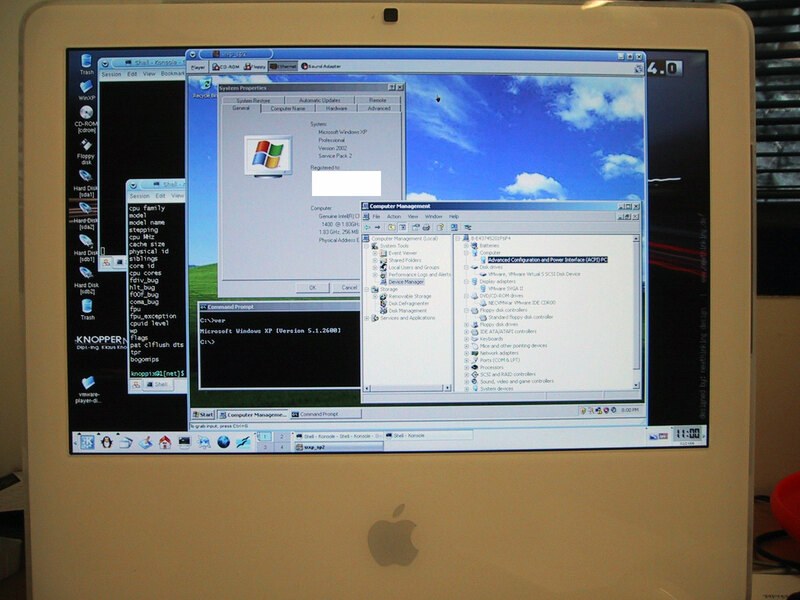 We are releasing the first pictures of Knoppix 4.0 running on a 17-inch iMac Core Duo. The X Window system is shown running at full resolution (rather, fuller resolution ? 1472×900 ? notice that the bottom right edge of the KDE “dock” is cut off). Most (but not all) aspects of the hardware seem to work, but we have yet to analyse exactly what doesn’t work and assess how much work it might take to get such things working. Once we have tested the system a bit more, we will try to release a full Knoppix distribution through Bit Torrent. We also have to trawl through the kernel source and the umpteen kernel “config” files so that we can release a coherent set of patches. We now have Windows XP running on the Intel-based Macintosh ? as a guest operating system under the Linux version of VMware. This is quite exciting and promising, especially since the performance of Windows XP seems quite amazing (based on our limited test run so far) ? mind you, the kernel and the environment we are using experimental and unoptimized, so it would not be unreasonable to expect even better performance. To anybody who has used Windows XP under Virtual PC on the PowerPC version of Mac OS X: you will simply be blown away by how fast Windows XP runs under VMware on the new hardware.